Since the invention of the first industrial internal combustion engined forklift in 1917 by the American Eugene Bradley Clark, “The Forklift” has been among the leading providers of Material Handling Equipment, offering excellent products and services. Practical task - practical solution. This solution has been a key theme in the 100-year materials handling story of CLARK that started at Eugene Bradley Clark’s company in Buchanan, Michigan in the United States. The mechanical engineer and entrepreneur initially produced drilling equipment for the railroad industry, as well as steel rims and axles for cars - he then asked the efficiency question: How can I move material from A to B without muscle power, i.e., faster and more efficiently? He specifically referred to the transportation of sand and heavy cast blanks on his premises. The CLARK team built a three-wheeled platform wagon with cargo box for loads of up to two tons. The funny thing was: Steering was inverted, there were no brakes - but the vehicle named “Tructractor” served its purpose. In 1920, the “Truclift” followed, the first fuel-driven truck, before CLARK launched the “Tructier” in 1928 which was the first forklift with a hydraulic lifting system. Driver efficiency became popular in 1942. 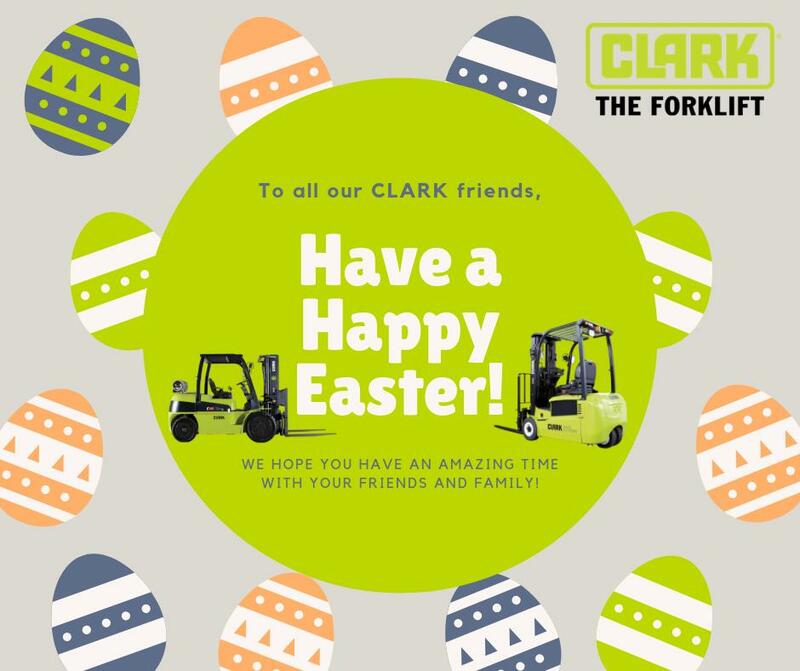 CLARK built the Carloader, the first electric forklift that could be used for an entire work shift. In 1943, CLARK was the first forklift manufacturer in this sector to add warning and safety labels to their vehicles. Meanwhile, because of its popularity “CLARK” and “forklift” had become a synonym, the company was the market leader in the industrial truck segment in the 1950s and 1960s. However, innovation did not slow down: In 1952, CLARK expanded the portfolio by adding operator training programs. Nobody had ever offered such training before. Technology jump in 1956: CLARK developed the first nested I-beam upright. This innovative design improved the stability of the upright tremendously. A double hit occurred in 1967: Clark again achieved an industry first with the introduction of the first operator overhead guard as standard equipment on sit-down rider trucks. The TW was also developed and introduced to the market as the first highly maneuverable 3-wheel electric forklift. In 1976, CLARK produced the 500,000th forklift—the company cracked the one million mark in 1997. Just in time for their 2017 anniversary, CLARK presents the centennial edition of the internal combustion forklift series C20-35 and GTS20-33. The special edition with capacities of 2.0 to 3.5 tons takes center stage at the specialist fair LogiMAT in Stuttgart from March 14 to March 16, 2017 (Hall 6, Booth 6F41). 100 years after Eugene Bradley Clark invented the forklift, CLARK presents both counterbalance trucks in their distinct anniversary look. The GTS20-33 series was first introduced in 2016 and is suitable for various goods distribution, production and storage purposes in the volume market. “One Purpose. One Brand. One Legacy. One Century." This is the slogan that CLARK, as the inventor of the forklift, presents itself to the market in 2017. The new GTS20-33 introduced in 2016 shows what makes CLARK a cult brand on the global industrial trucks market: As usual, CLARK combines top-quality standard configuration and high-performance, fuel-efficient engines (diesel and LPG) with a solid structure based on CLARK’s own “Built to Last®” principle. The GTS20-33 with standard wet disc brakes combined with high-performance is available with a load capacity ranging between 2.0 and 3.3 tons. The solid structure provides a high throughput rate in rough applications with a low total cost of ownership. Optically, the anniversary edition of the GTS20-33 appeals with its black rims, the Centennial log on the upright, the anniversary edition sticker on the chassis, as well as the special edition seat with 1917 imprint, together with a Eugene Clark plaque. "One Purpose. One Brand. One Legacy. One Century." This is the slogan that CLARK, as the inventor of the forklift, presents itself to the market in 2017. The new GTS20-33 introduced in 2016 shows what makes CLARK a cult brand on the global industrial trucks market: As usual, CLARK combines top-quality standard configuration and high-performance, fuel-efficient engines (diesel and LPG) with a solid structure based on CLARK’s own “Built to Last®” principle. The GTS20-33 with standard wet disc brakes combined with high-performance is available with a load capacity ranging between 2.0 and 3.3 tons. The solid structure provides a high throughput rate in rough applications with a low total cost of ownership. Optically, the anniversary edition of the GTS20-33 appeals with its black rims, the Centennial log on the upright, the anniversary edition sticker on the chassis, as well as the special edition seat with 1917 imprint, together with a Eugene Clark plaque.